Oh emm jee Lan, I actually was thinking about making a bacon based vichyssoise for this month's challenge (very unconventional), but decided not to because I really wanted chowder. 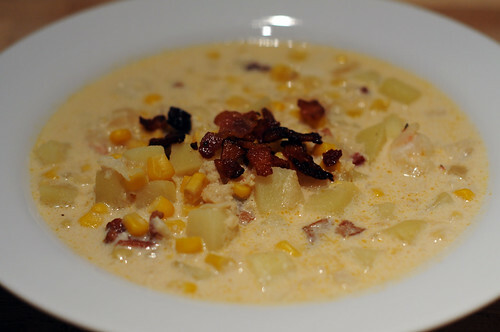 So I ended up making corn, crab and shrimp chowder, I guess I'm glad I did!! This is a recipe that has sort of grown over the years, it always comes out different, warm, better, tastier and this time I don't know why but I felt the need to use shrimp instead of clams or white fish. I really just like this recipe because it's full of potatoes and corn, two of my favorite soup ingredients. (2) cans of crab (lump preferred) or those of you in the south, get the fresh stuff! In a pot, cook finely cut bacon until almost brown, remove from heat and disgard all but one tablespoon of the bacon fat, set the bacon aside. Put pot back on the burner and add in onions and sautee until transluscent, add bacon back in and sautee for another 2-3 mins, do not burn bacon to a crisp. Season with salt, back pepper. Add in seafood stock and bring to a simmer. 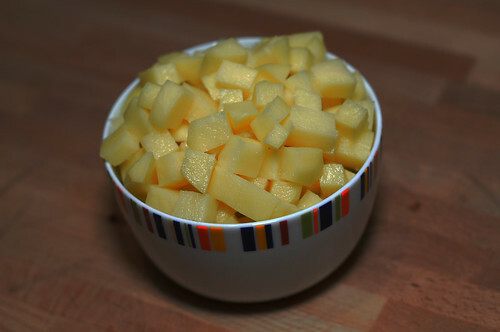 While it's coming to temp, peel & cut potatoes into small cubes. Add in can of corn (with liquid), garlic, thyme, salt, pepper, 1 tablespoon tabasco and woooorcestershire sauces and bring to a gentle boil. Add in cans of crab with juices, and potatotes and let simmer for 30-40 mins. While soup is simmering, peel, de-vein and halve shrimp. Add in light cream, old bay and shrimp, bring back up to a light simmer for 15 mins. You may need to skim the top of the soup as needed. Cook up some more bacon and crumble on top, serve with some warm delicious bread on a cold day. 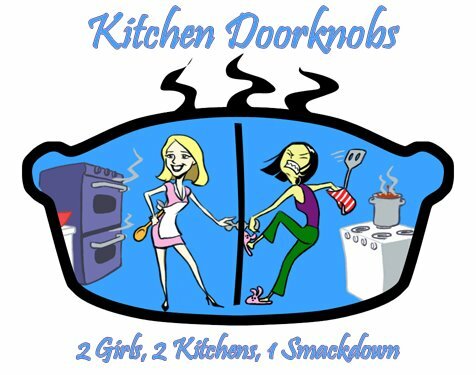 Well, with your time off, I thought you could use a few cooking inspirations... 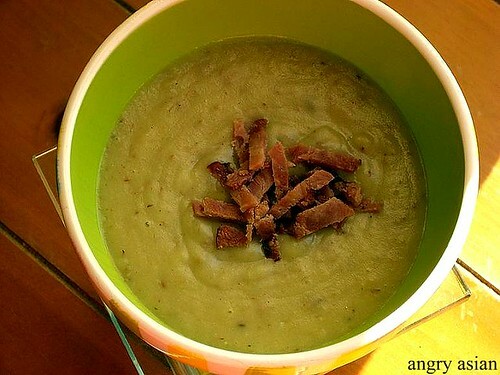 I think you should create a healthy (maybe even use the Cuisinart to finely grind broccoli and add a bit) leek and potato soup with bacon for your current challenge. 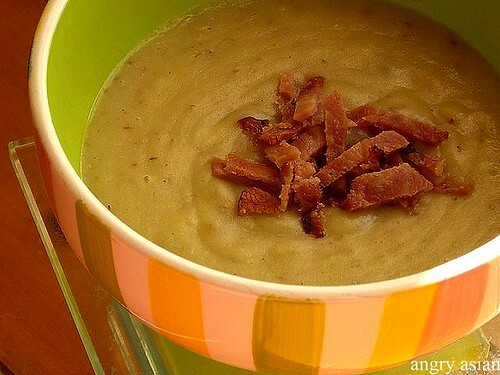 Bacon would compliment leek and potato so well, dontcha think? The soup comes out a lovely creamy green, and tastes like heaven. Very soothing, especially in the winter time. Is it cheating to use a recipe? Because my mom has a great one, if you need. 2 medium leeks, 2 medium peeled potates in bite size chunks, 2 tablespoons butter or olive oil, 4 cups of chicken broth (bouillon cubes broth is fine). Cut off ends and tough green parts of leek. I just use the white part, with about an inch of the green part. French from the countryside often use the whole leek, and just cook longer, but I think the tough leaves are bitter tasting. Slice leeks sideways to rinse very thoroughly and get out all sand/dirt (this is the only hard part of leek soup). Slice into 1/2 inch rounds, and saute in butter or olive oil over medium heat until the leeks begin to change color slightly (they'll get brighter). Do not brown them! Add the potatoes and saute for another minute or two, stirring. Add the chicken broth and bring to a boil. Reduce to low, cover and cook until potatoes are tender about 15 minutes. You can eat it this way, or put it in a blender or cuisinart to make a delicious cream soup--don't over process. It's yummy to sprinkle with pepper and stir in a big spoon of fresh cream or sour cream in the bowl. j'adore this soup. it did not come out green tho. i didn't add broccoli and use the greens of the leeks. i actually have a container in the freezer for consumption later this month. and of course, i added some bacon on top. stay warm out there doorknobs, it's effing cold!